Kuzushi: Literally meaning to “break balance.” In Kokondo, the term Kuzushi is extended to denote the energy and motion that allows one to utilize the size, strength, and commitment of an attacker against him. Jushin: The centerline principle. Jushin is the concept of manipulating, controlling, and destroying the center of gravity/mass of an attacker to achieve the full potential of a technique and achieve maximum effectiveness in the end result. Shorinji: The principle of points and circles. The utilization of circular and linear/pointed movements formatted to promote efficiency of movement. Undoubtedly, the new enthusiastic student reads everything he can about Kokondo. As he opens up his copy of Sankosho or visits the various IKA websites he reads time and time again about these three principles and the preeminent role they play in defining Kokondo as a unique and powerful system of self-defense. Given this honest reality, the student may begin to wonder why it is that Shorinji seems to be given such an important position within Kokondo literature but yet doesn’t seem to “really” be as important as the other two principles. Worse yet, he may question his instructor’s ability to articulate the concept clearly or even the instructor’s understanding of the principle itself. Overtime, this could undermine the instructor’s credibility in the student’s eyes. Moreover, it could leave the student with an unfortunate under-appreciation for this equally indispensable principle. In his mind, Shorinji becomes the “red headed step-child” of the Kokondo principles. Although not outwardly acknowledged, in his inner thoughts, he views Kuzushi and Jushin on a pedestal above that of Shorinji. This is a colossal mistake to make. It is honest and fair to wonder why this discrepancy exists in the verbal attention given to Kokondo’s principles. The answer comes from a deeper analysis of Shorinji. In this way the student will come to fully understand and appreciate that although Kuzushi and Jushin are verbalized much more readily, Shorinji is most certainly taught, understood, and articulated by their sensei. Kokondo by its nature is about physical movement. Ultimately, no amount of talking about or verbalizing any idea makes one capable. As Master Robert likes to say, “condition yourself for movement!” With Shorinji this is especially true. Shorinji is about how to move. It is most frequently taught on a non-verbal level within every technique. Due to the overarching nature of Shorinji as physical principle – it can be accurately argued that Kokondo sensei spend MORE time adjusting the various elements of Shorinji within a technique then they do Kuzushi and Jushin! This is where the bulk of the time is spent during instruction and adjustment of technique… even if the term Shorinji isn’t verbalized. Consider all of the specific corrections received that don’t involve the words Kuzushi or Jushin. It is accurate to say that the time spent on those corrections is spent adjusting the various aspects of Shorinji within a technique. How the Jukidoka steps into a throw, adjusts his hip, pulls his partner over a fixed point are all components of Shorinji! If you’ve been told you need to add “more hip” (point) or adjust your “pull” in a throwing technique (circle around a point) – you’ve essentially been “told” to adjust elements of Shorinji. If in preforming karate kihon you’ve been corrected on the order of rotation in your blocking arm (shoulder, elbow, wrist) or shown how to produce more energy output from your hip – the Shorinji in your technique has been adjusted! With that stated, it might be fair to say that the term Shorinji may be utilized less frequently in verbal instruction. However, it would not be fair or accurate to say that it is less important or infrequently taught! It is simply the nature of Shorinji to be taught much more effectively through physical instruction and much less so through verbal terms marked by exclusivity. EACH of the principles is dynamic; however, Kuzushi and Jushin by their nature can be referred to in a singular manner. Kuzushi can be taught through the “Jukido Clock” and you can be told to “hit Jushin.” With Shorinji this is much less effective as a teaching tool due to the numerous individual points and circles that can be identified within a sequence of movement. Shorinji can be referred to on the micro level (perhaps the yoko shuto uchi portion of the core front choke escape or a single punch in a larger sequence of techniques) or it can be referred to on a more all-encompassing manner that views an entire self-defense sequence as a whole. Shorinji is multifaceted enough that it be accurately viewed from both the viewpoint of the smallest piece of a technique to an expansive view that more broadly defines the movement of an entire kata (saifa),the flow of energy within the skeletomuscular system, the force dynamics within a self-defense sequence, or even difference between entire martial arts systems. Master Greg Howard, the IKA’s Kaicho and chief sensei, has gone a long way in further developing the understanding of Shorinji as a principle developed by his own sensei, founder – Shihan Arel. At the request of and blessing from Shihan Arel, Kaicho Howard has continued to refine the principle of Shorinji so that a more fully developed understanding can emerge. The end goal of this refinement is a more highly developed Kokondo for the present and future. Based on the development and refinement of this principle we can come to a powerful understanding of Shorinji. One way of thinking about Shorinji is to think of it as a type of dynamic “glue” or flowing bridge between Kuzushi and Jushin. It establishes a cohesive link (or set of links) between utilizing the movement/balance (kuzushi) of an attacker and conclusively achieving the desired end result of controlling the attacker’s center (jushin). Kuzushi can be thought of as “why” we can operate altogether. Kuzushi gives us the opportunity (not the guarantee) as the smaller and weaker individual to overcome a larger and stronger foe. Jushin on the other hand can be thought of as the “what” we are looking to acquire or the “where” we are going with our technique. It is the end destination that we want to achieve because it allows us to most decisively finish our technique or attacker. Shorinji than can be thought of as the “how” we take advantage of the initial opportunity afforded by Kuzushi and get us to the end destination that we want to achieve – Jushin. For all of the perceived lack of attention afforded to Shorinji, it is this principle that allows us to truly utilize Kuzushi and get to Jushin in our techniques. Usually Shorinji is not contained in only one “set” of points and circles in an entire self-defense sequence but rather there is a compilation of Shorinji “sets” that bind together to fill in the spaces between and around Kuzushi and Jushin. This simple but masterful explanation by Kokondo’s foremost authority demonstrates that Kokondo’s conceptualization of Shorinji is the manner in which the Japanese martial concept of Kime is achieved. Shorinji is not only identifying markers of points (no pun intended) in time within a particular technique but also an overarching principle in defining how we move. 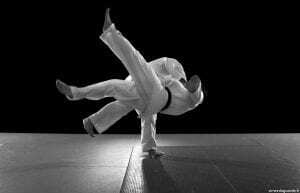 Shorinji is THE major component that allows us to make tangible use of the state of balance/motion created via Kiuzushi so that eventually we can apply energy in a dynamic fashion to destroy, break, or control jushin. Let us consider the basic cross wrist grab defense with the wrist lock (ichibai tekubi uke). The initial action is to either create kuzushi or utilize the kuzushi that is already present in the attack. From that physical point of connection in space & time, you aim to efficiency utilize your body dynamics to flow from that point A toward point B (jushin). The bridge that links kuzushi to jushin is the application of shorinji. If one loses the initial kuzushi and is unable to get to jushin or gets to Jushin but the pathway to Jushin was congested, rough, or otherwise inefficient – the major error was related to Shorinji. If the process seemed efficient, smooth, and yet powerful – it was a technique that was marked with optimal utilization of Shorinji. Shihan Arel was fond of saying that an “advanced technique is a basic technique done thousands of times.” If one has a yellow belt and a sandan perform the core rear choke defense side-by-side, they are both performing the same technique…but simultaneously it isn’t the “same” technique. They are the same in that they are both performing the core Kokondo response. However, the yellow belt is performing it in its “basic” form while the sandan is performing it in an advanced manner. .. It isn’t that the yellow belt isn’t performing the technique correctly. On the contrary he might have all the right steps. They are both performing the sequence of movements correctly. It is HOW they are moving – not the actual moves themselves. It is about the nature of the movement within the move! Although all three principles are responsible for the transformation from basic-to-advanced technical execution, Shorinji truly plays the essential role. Optimal use of the various points & circles is like smoothing out a sculpture with sandpaper. The sculpted technique is smooth as smooth can be where it should be and linear, sharp, and direct where it needs to be. The harmony between these opposite forces creates a dynamic flow of power that would otherwise be impossible. Shorinji is the major distinguishing factor between the step-by-step performance of the beginner who is doing the technique “right” and the expert synergy of movement and power of advanced practitioner. In refining the principle and helping the whole of Kokondo understand it much more freely, Kaicho Howard has explained that there are three interconnected aspects of Shorinji which can described quietly simply as: In, Out, and At. Let us consider one possible interpretation of basic reverse punch (seiken gyaku tsuki) in the context of In, Out, and At. The left hand is retracting and in doing so is pulling an attacker IN. The nature of the retraction which brings the attacker in to us is both linear and circular. The left hand retracts in straight line while corkscrewing circularly counterclockwise before “locking in and at” in its final position. 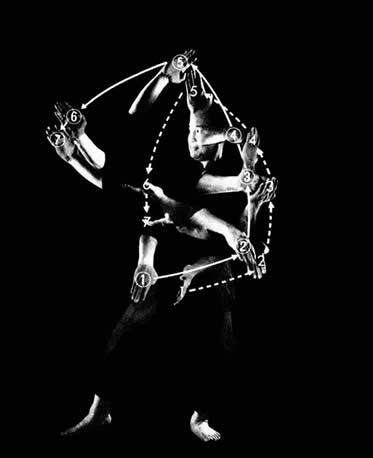 The right hand is extending OUT and away from our body, also on a linear path with its force multiplied by the circular clockwise rotation which will provide speed and penetrating power AT the point of contact. His muscular tension was streamline but relaxed until the point of impact – at which point the body became tense (loose, loose, loose, TIGHT!). 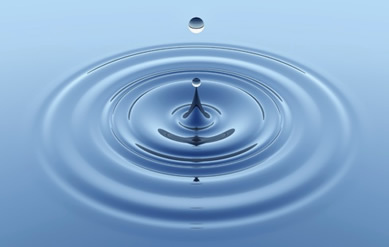 AT that “point” a circular ripple effect of transferred energy occurs “in” the attacker’s body. This energy begins moving “out” from the point “at” which impact took place. No different than dropping a pebble into a body of water. The pebble drops “in” the water “at” the point of impact. “At” point of impact between the pebble and the water, waves ripple “out” in perfect circular waves. This creates, at least until the VERY final conclusion of the overall sequence, an “Alpha and Omega” effect within our techniques. That is to say that the “point” at the end of a technique is at the very same time the very beginning of the next phase of our defense. The force dynamics and energy transfer are very much the beginning and the end. For example, in the Jukido Jujitsu double collar grab defense: The up and outward motion of your shuto stops at a point in space and drives in at another point (the collar bone). The “end” point of that shuto fully concludes that particular technique but AT THE VERY SAME TIME is the start point that allows you to move in and set up the attacker’s weight at another point (his right heel). The setting up of his weight at a specific point on his right heel “ends” that action (tsukuri) but it is also at the very same time the “start” point from where the kake or execution phase of our Osoto Gari can begin. The tori’s right leg in the kake phase of the Osoto Gari moves slightly out and then back in toward the uke’s leg and eventually connects at the attackers leg. The transfer of energy from our leg to his leg is the end of that point…this “end” point launches the uke’s body into the air and ultimately ending at another point…the ground. As the body impacts the ground a point of impact is created. At that impact point there is a ripple of energy sent into his body that has bone shattering potential. Again, like the pebble being dropped into the water. The basic pressure point application used for the core front under arm bear hug defense is simple but a clear illustration of Shorinji: Connect at a particular location at the front of the ear, circle out from that initial point of contact following contour of the ear until you are at the correct location. At that point you drive your technique in to the attacker. This point of energy transfer creates a shockwave originating in the local nerves and ripples throughout the rest of the Nervous System. This ripple effect forces the attacker to let go with his hands (which you never actually touched) and to move out and away from you. This provides you with opportunities to take advantage of his weakened state of balance and vulnerable center. Throughout the technique your maintenance of your energy flow is critical. You are physically loose throughout and then rigidify at the moment of energy transfer; doing so at a specific place in time and space. Again the ideal utilization of Shorinji is kime! For the Kokondo practitioner who studies both Jukido Jujitsu and Kokondo Karate, understanding Shorinji on a deep level is absolutely necessary to understanding: (A) Why the two arts are uniquely their own systems and (B) why they still fit within the umbrella of Kokondo and can complement each other without conflicting. One doesn’t have to be a Kokondo-ka to comprehend that visually Jukido Jujitsu highlights more circular flowing movements and Kokondo Karate visually emphasizes a more direct-straight line approach. An observer of a Kokondo demonstration could easily see this. Because this is a clear and very visible “difference” in how the Jukidoka and Karateka are moving – these differences function to show how each individual is utilizing Shorinji. They both use Shorinji but they move differently. This creates unique opportunities, tactics, and movement styles between our jujitsu and karate systems. In a very real way, the distinction between the two arts is based (in large part) on how one moves and thus it is based on Shorinji. This also explains why they can complement each other. Although each art is designed to be 100% complete as a self-defense system on its own, one can see how the concept of unity between opposites that defines Shorinji can be applied to the Kokondoka who practices both karate and jujitsu. Shorinji makes each art individual and unique – but also plays a enormous contributing role in bringing them together under the Kokondo umbrella in a unified manner.